Our services and products are designed to accommodate all aspects of technology including networking, hardware, applications, voice, data, and security. Our staff has years of experience and are capable of helping you with a simple computer problem or a complex multi-location network. We enjoy helping our customers solve computer repair problems and strive for 100% customer satisfaction. The Citren Group offers very competitive rates and enjoy building lasting relationships with our customer. The American Legion Post #370 in Llano is the headquarters for veterans, and also serves as a rental building to remain self-sufficient. THE AMERICAN LEGION BUILDING IS OUR POST HOME. A PLACE FOR THOSE WHO SERVED THEIR COUNTRY AND FELLOW COUNTRYMEN. PLEASE SHOW IT THE HONOR IT DESERVES! Please call Tommy Allen at 325-423-1737 to inquire about a rental date. The building is available to rent on a first come-first serve basis. The amount of rental is based on the time and use of the building. Your rental time begins at 8a.m. til 12:30a.m..(approx 16.5 hrs) If you need additional time on the day before or the day after we will charge $10 per additional hour. In order for you to use this time we would have to turn away other possible rentals. The rental of this building is our main income. We are a non-profit organization. Cactus Homes & Ranch Management, Inc.
Castell On The Llano is a Reservation service for several wonderful vacation rentals in the Castell / Llano area. Most properties are on the Llano River. If you're looking for a romantic getaway or large group getaway, I have the property to fit your needs! CLICK HERE FOR BUILDING RENTAL AGREEMENT FOR THE CASTELL COMMUNITY CLUB. CLASS A RENTALS & SALES,INC. Celebrating 13 years of business in Llano, Texas - 100% Hill Country Local!!! Backhoes, Skid Loaders, Trenchers, Tractors, Excavators, Bull Dozers, Forklifts,Scissorlifts, Man-Lifts, Scaffolding, Floor Equipment, Concrete Equipment, Pumps, Compaction Equipment, Painting Equipment, Post Hole Diggers, Air Compressors, Rock Drills, Saws, Electric & Air Tools, ...MORE! ALSO RENTING: Tents - All Sizes, Tables - All Sizes, Chairs - 4 Styles, Table Cloths in over 200 colors & fabrics, Dance Floors, Chandeliers, Margarita Machines, Chafers, Beverage, Glassware, Flatware, Plates - KID BOUNCES TOO! Cooper's Old Time Pit Bar-B-Q, Inc. The Rock Shop has been in Llano since the mid 60's and was operated by the Hazlewood family through the late 90's. After years of being closed, we had the opportunity to reopen this famous shop under the management of Frank Rowell & Patricia Felts. Our goal is to preserve the family friendly atmosphere and Customer service this shop has been known for. We have added many new items to the store since reopening. Our line of sterling silver jewelry includes a large selection of rings, pendants, chains and beaded necklaces and earrings. There are T-shirts from the Mountain T Shirt Co. that are all made with natural dyes, (Over 50 styles to choose from). Rugs and blankets from El Paso Saddle Blanket Co. and lots of sterling silver jewelry to choose from. Llanite pendants in sterling silver are now available. For a fantastic view of Llano and the beautiful hill country, and to get to know Frosty Miller, view "Frosty The Land Man - Ranch Properties TV with Keith Warren - Llano, Tx"
A salon that offers it all! Tax services now provided at the Kingsland and Llano locations. Stephen is a factory representative for a number of sporting goods manufacturers, some fishing, motorcycle accessories, some food items and other miscellaneous items. He visits with the buyers at places like Academy and Bass Pro and some small dealers. Emily is an Associate Broker with Jesse James Real Estate, and a License Property & Casualty Agent with AllTex Insurance in Llano. She is Second Vice Chairman of the Chamber Executive Board, Historian for the Womens Culture Club and Chairman of the Finance Committee for Lutie Watkins Methodist Church. In her Real Esate business she is a member of the National Association of Realtors and Texas Association of Realtors and the Highland Lakes Board of Realtors. She is also member of several state committees. Steve and Emily have three children and 6 grandchildren. He is an avid motorcyclist and fisherman. Emily likes to ride, when it is good weather, but will fish in just about any weather, given the chance and time. They are general members of the Chamber of Commerce. Hyder & Son, your Hill Country security professional! Mobile, residential and commercial locksmith servicing Llano, Burnet, Kingsland, Sunrise Beach, Horseshoe Bay, and the Hill Country area. Senior discounts; bonded and insured. Please see our website. LAUREN CONCRETE IS FAMILY-OWNED AND OPERATED.We manage day-to-day activities from our Austin and Round Rock offices, overseeing our batch plants, quarries, and the Ready Mix Fleet. Llano Tire & Automotive Center, Inc. Please come support your future Yellowjackets!!! Longhorn Cavern State Park is a state park located in Burnet County, Texas. The land for Longhorn Cavern State Park was acquired between 1932 and 1937 from private owners. It was dedicated as a state park in 1932 and in 1938 was opened to the public. In 1971, the park was dedicated as a National Natural Landmark. From 1934 to 1942, Company 854 of the Civilian Conservation Corps constructed residences,pavilions and an observation tower in the National Park Service Rustic architectural style. They also explored and developed the cavern and built walkways. In the 1920s, during the prohibition period, the cavern was used by Burnet County residents as a speakeasy. Performing musicians would entertain through the night. In 2004, Longhorn Cavern re-introduced chamber music to the cave with the creation of the thier annual Christmas Caroling in the Cave events. Guided cave tours and given daily. Along with our regular Daily Tours, we offer some very unique tours such as the Wild Cave Tour, Paranormal Tour, Geology Tour, Photography Tour and Biology Tour. Reservations highly recommened for all specialy tours. Come on out and "Be cool"
The cavern and above ground facilities are also available to rent for private parties and events. Just contact us for more info. 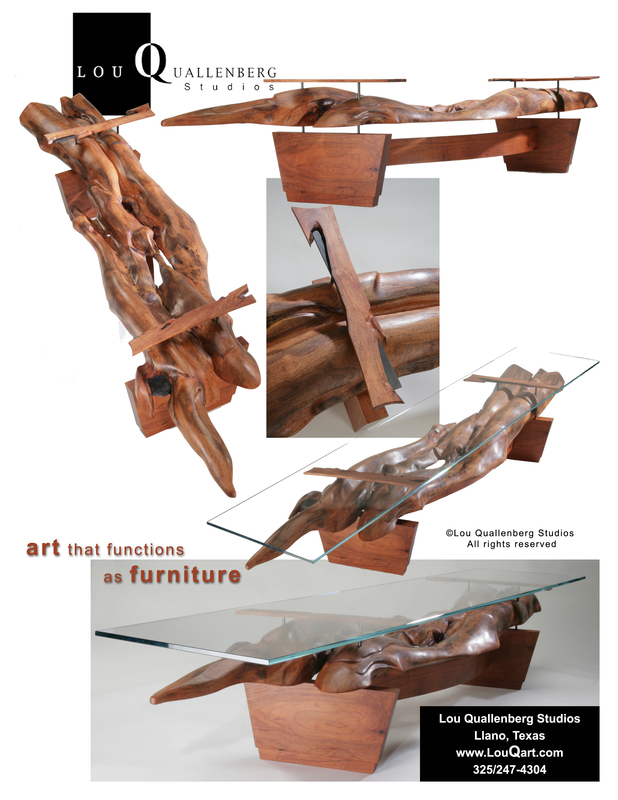 Lou Quallenberg Studios creates award winning, contemporary, mesquite furniture. The look is Lou Quallenberg's own unique design style using sculpted, live edge, mesquite slabs and curved mesquite laminates that look at home on a huge Texas Ranch or New York City Penthouse Apartment. Our growing international client base can attest to that! 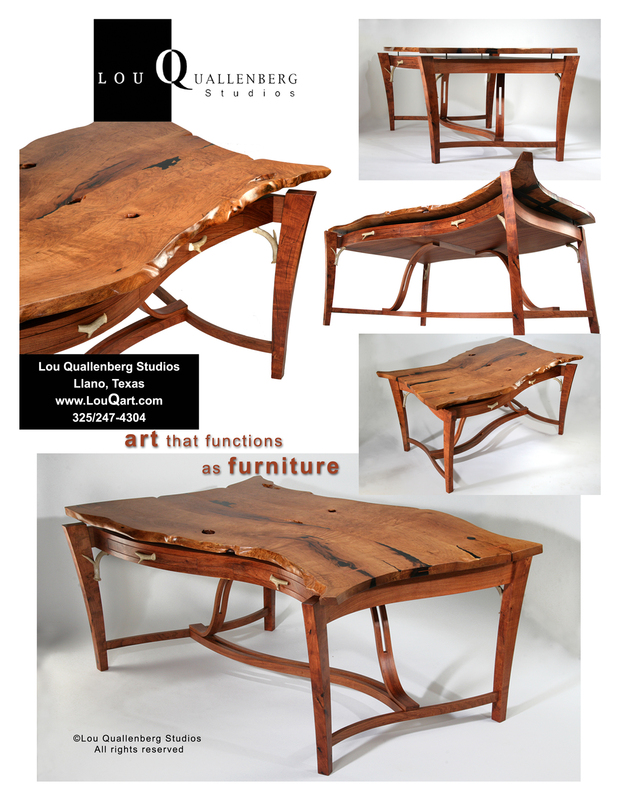 (325)247-4304 PLEASE CALL FOR AN APPOINTMENT to view our available pieces, meet the artist and or see the shop. Click here for video of services! CLOSED TO HUNTERS AT THIS TIME. "Marketing the Homes and Homesites of Horseshoe Bay and Lake LBJ"
We represent the finest Horseshoe Bay Real Estate homes, condos/townhomes, and building lots available in Horseshoe Bay Resort Texas. Horseshoe Bay is located on Lake LBJ. Whether you want waterfront, golf course, spectacular views or hill country acreage, we have the selection that you are looking for. RE/MAX Horseshoe Bay Resort Sales Co. has been marketing the homes and homesites of Horseshoe Bay Resort since 1988. Nobody has more experience with Horseshoe Bay Resort Real Estate than our highly professional sales staff. We have access to the Highland Lakes Multiple Listing Service, San Antonio Multiple Listing Service and Austin Multiple Listing Service. Please see our Facebook page for the latest church information. If you are interested in renting the Schorlemmer Hall at St. James, call Jean Cockrell at 325-423-0959. This rental accommodates up to 250 people. Guided trophy and management whitetail hunts. We only offer a limited number of hunts per year. Currently, we do not offer meals and lodging, but can suggest and even arrange for lodging within Llano. Give us a call when you're ready for the hunt of your life! CALL JAMES STOTTS AT 325-388-4443. Open at 100 Legend Hills Blvd, Llano, TX, in the community offices of Park Ridge Apartments, from 8 to 5. We help job seekers and employers. For tax preparation in Llano, TX you can count on Morrison F. Smith, RTRP at The Tax Doctor. Morrison F. Smith, RTRP assists taxpayers and small businesses with taxes in Llano, TX and the surrounding communities. Whether you are an individual or a local business in or around Llano, TX, Morrison F. Smith, RTRP has years of valuable experience as an IRS registered tax preparer. Contact Morrison F. Smith, RTRP, tax filing specialist in Llano, TX, for help with your taxes. Specializing in Lake Buchanan, Inks Lake, and the city of Llano with vast knowledge of real estate in both Burnet and Llano Counties. Expertise in Negotiations, Contracts, Permits, Area nformation,and most of all listening to your real estate needs and wants. As Broker and the part owner in the company, it is my priority to ensure we provide you with the finest and best service available,and to be able to stand behind the phrase, "No one Knows the Country like we Do!". Through continued education, vast marketing techniques, many years of experience, long hours of work, integrity, honesty and sincerity, I believe we have the tools you will need to sell your property or find the property that fits your needs. My Staff and I look forward with helping you with any of your real estate needs! Windchime at the Village offers gracious assisted living and memory care in the scenic Texas Hill Country. Health and Fitness! I teach Turbo Kick exercises classes at our Llano Community Center. I am also trained and certified as a PiYo and Hip Hop Hustle instructor. It is my passion to help you on your journey to health and fitness! I am also a Fitness coach for Team Beachbody, the makers of P90X, TurboFire, Insanity and many more. Here I get to mentor and guide many more with personal one on one interaction for FREE!! I am here to help and encourage you all the way to your success. 8 am - 5 pm Monday through Friday / 24 hr Emergency Service. Now certified for septic systems. For up-to-date information on the Trail of the Deer in Llano, TX, please visit our Facebook page! Ask us for information on organ donation registration! Please consider chosing to do so; one donor can save up to 8 lives. Located 16 miles north of Brady in McCullough County. Four hunters with guests allowed on 700 acres of high-fenced managed ranchland. Trophy whitetail, breeder bucks, scimitar oryx, barasingha, and red deer. Weekend, week, or package deals with cabin. Call KJC's Rockin' P Ranch! We have just moved into our larger and more convenient location. Please come in to see our shop. We feature wildlife fabrics with deer and eagles. We also have country themed fabrics, wildflower fabrics, batiks and novelty fabrics. If you are looking for children or baby fabrics, this is the spot. We also are your western fabric store with boot, saddle, rope and cowboy fabrics. Located in Southeast Llano County. Tow VFD Annual Fish Fry & BBQ held on the Saturday of Memorial Weekend in May! Come out to the Tow Fire Hall for the best fundraiser in the Hill Country!!! Support your local VFDs. Last Saturday of every August, this clay shoot benefits the provision of scholarships to Llano students. Come join us for a fun-filled day of sport and community! We are currently booked for the 2013 season. Please check back for openings in case of cancellations. Dutch Mountain Ranch is 1245 acres located in a very remote scenic area 22 miles southwest of historic Llano, Texas. Wade the sandy creeks, fish the beautiful ponds, or hike to the summit of Dutch Mountain and enjoy the wonderful panoramic views of Enchanted Rock and the surrounding Hill Country. Enjoy the lovely, spacious lodge with a view which accommodates up to 13 guests. This is "roughing it in style". Dutch Mountain is an official Texas Century Ranch. This means that Dutch Mountain has been registered in the Texas Family Land Heritage Program, certifying that it has been maintained in continuous operation for more than 100 years by the same family. View from Dutch Mountain Lodge porch. Kingsland Hills Care Center is a community based skilled nursing and rehab facility that's been here for over 32 years. Our Fast-Track Rehabilitation and Recovery Program offers clients an innovative program of physical, occupational, and speech therapy right inside our facility. Every effort is made to help residents feel comfortable as they work through exercises of the body, as well as the mind, while focusing on a speedy return to their prior level of functioning. We provide the best possible short-term and long-term care in an environment of compassion and consideration. Our residents are treated with dignity and respect; keeping their individuality intact at their "home away from home." We also provide a tailor-made care plan for each resident; addressing all aspects of their quality of life. Our nursing staff utilizes the Accu-Nurse System which allows for improved communication and quality of care. Payment sources include: Medicare, Medicaid, Insurance, Private Pay including Credit cards. Schedule your tour today, we are here to help you find the right home for you or your loved one. Kelli is a Llano native, she and her family has moved back to Llano after being away for several years. They have 3 children ranging in age from 11 to 17. Their life is active with school activities and they all enjoy the great outdoors. She loves to hunt and fish, and is a Part time designer at the local Flowershop of Hometown Floral. Alderwomen for the City of Llano, City Council. Board Member of Planning and Zoning for the City of Llano. Former Board Member for the Llano Community Center Board. 20 years of experience with nine being a multi-million dollar producer. Kelli has expansive knowledge of farm and ranch sales as well as residential. Expertise in Negotiations, Contracts, Permits, Area Information, but and most of all listening to her clients real estate needs. Through continued education, vast marketing techniques, and with integrity, honesty and sincerity, she has the tools and knowledge you will need to sell your property or find the property that fits you. Please give her a call or drop her an email. Services include free pregnancy testing, free limited sonogram, non-medical ultrasounds, confidential sessions with staff to discuss your issues, community referrals, assistance with WIC and Medicaid applications, post abortion support groups and more. Phone service available Monday - Friday 9-5; client visits 10-2, except on Fridays. Here in Llano County, ACS has their annual Relay For Life. Please visit our website for more information or Patia Sandifer at 512-919-1810. As a means to raise money for the American Cancer Society, AEN will host their 7th annual, Tolbert sanctioned, BBQ & Chili Cook-off in Glen Rose at Tres Rios River Ranch on March 22 & 23rd. Full hook-up RV camp sites and cabins are available for Friday and Saturday night. All cooks are welcome and invited to participate. Prize money will be awarded for cook-off winner. This year we are adding a car, truck, and bike show to the event. The show will take place on Saturday, March 23rd. There will be separate categories for cars, trucks, and bikes. All proceeds from both events will go to the American Cancer Society. For more information or to make reservations for the cook-off contact Lori Nunez 817-781-5082. For information or reservations for the car, truck, or bike show hosted by DFWCarShowInfo.com, contact Ed 254-722-2027, [email protected] . Pecan Creek Lodge is a peaceful, quiet, secluded Hill Country retreat located 3 miles north-west of Llano, Texas- "Land of Legend and Lure." Our lodge gives you the Texan style of western living with all the modern day amenities. The fully furnished kitchen provides all you need for cooking for large groups. Sugar, flour, coffee, tea, and seasonings are provided for your convenience. The lodge is decorated with an emphasis on white tail deer, hunting, and fishing. Terra cotta tile floors are complimented with accents of soothing teal green throughout. Relax on the full length porch overlooking Pecan Creek. This lodge has three bedrooms and accommodates up to thirteen guests. Pecan Creek Cottage is a peaceful, quiet, secluded Hill Country Retreat located just three miles northwest of Llano, Texas - "Land of Legend and Lure." Nestled in the beautiful scenic Texas Hill Country our cottage is the perfect place for that secluded retreat. The fully furnished kitchen provides all you need for cooking great meals. Breakfast food is there for you to prepare at your convenience. Also provided are sugar, flour, coffee, tea, and seasonings. This one-bedroom is ideal lodging for two. The Buckhorn Hall is a live music venue, sportsbar, and central Llano location to rent for special events. We are located in the Historic Llano Rail Yard District. Llano Alliance for Drug Intervention(L.A.D.I.) assists Llano County in the prevention and intervention of drug abuse. February 2014 has been proclaimed "Drug Awareness Month" by the Mayor of Llano. On March 1, 2014 a Rally will be held at the American Legion Hall beginning at 9am for Llano and surrounding communities. Local and County authorities will share updates concerning the drug arrests in the area. Intervention information will be available. Schools will be represented. Let's make this the newest Community Event. L.A.D.I. provides education concerning drug abuse to Llano ISD each year during the Red Ribbon Week Campaign, speaking to over 1000 children ranging from Kindergarten to 12th grade. L.A.D.I. partners with the Llano Police Department in the school programs, providing Red Ribbons in memory of "Kiki" Camarena. Officer Rub presents information to the children about the dangers of drugs and the laws that are in place for those who choose to use them. Christi Lundby at Heart of Hope Counseling & Mediation PLLC, partners with L.A.D.I. to teach and reach those who are already in the drug abuse cycle. L.A.D.I. is an eight year old organization that also partners with Lano ISD, Llano Judicial System and Llano Ministerial Alliance. Together we make a difference educating parents, children and community as well as helping those who are already in the cycle of drug and/or alcohol abuse. L.A.D.I. offers the Love Your Child Drug kits at a minimal cost of only $6.00 - Drug Kits and free drug education materials may be obtained at the Llano Alliance for Drug Intervention and Heart of Hope Counseling and Mediation office located at 1203 Ford Street, Llano, Texas. Wines Across Texas in downtown Marble Falls is a wine bar, bistro, and boutique. We are open Monday - Thursday from 11 am to 7 pm, and on Friday & Saturday from 11 am to 9 pm. A non-profit to promote Llano. River Sounds Recording Studio has been involved with audio and music production for fourteen years. Call Jeri Alice at 512-217-4596. To assist in the healing of body mind and spirit in accordance with God's Holy Word. Our prayer teams will minister in agreement for healing of body, mind and spirit according to the Word of God. We do Signs, Banners,decals,vinyl letters, engraving,and embroidery and school spirit wear. Blue Lynk, LLC is a Texas business with locations in Cedar Park and Llano. Our business originated by providing construction companies access to their documents via the iPad without the need for WiFi connectivity. We provide IT and computer support and services, both on site and over the phone. Our staff can assist with software/hardware installations, upgrades, troubleshooting and repairs. We also create and launch websites, develop custom databases as well as provide training on many programs, including Microsoft Excel, Word, Access, and Powerpoint. We are experts at deploying documents to iPads and accessing information via the iPhone. We are a small business resource. The new Llano Events Center serves as a fully-equipped rodeo arena with concessions and 192 horse stalls to rent. Please call the Llano Chamber of Commerce and Visitor Center at 325-247-5354 to book your event here! Click here for rental agreement. Click here for current calendar. 24hr Bodyworks is a friendly, non-intimidating atmosphere that will help you reach your goal. Free Weights, Weight Machines, Aerobic Equipment-Ellipticals, Treadmills, Rower, Bikes, TV, IPod dock, Free towel service and daily lockers. We serve "Grandma's cookin'" and homestyle meals that you've always loved! Season hunts. Gun for deer, turkey, dove, quail, hogs and predators. Cabin is 2-story stone house. 4 -6 hunters allowed. The Llano Sting is a Llano County girls' softball team that plays competitively. Please contact us for more info! A retail shop on the Llano Square across from the courthouse. We are open Monday - Saturday from 10 am to 5 pm, and Sunday 11 am to 4 pm. Hours: Thur - Sat 10am - 5:30pm, Closed Sun - Wed. Season deer lease for gun or bow. Deer, turkey, dove, quail, with a cabin & campsite with water and electricity. 300+ acres for up to 5 hunters. Located 3 1/2 miles west on Hwy. 71 in Llano, TX. Sandstone Street Bed & Breakfast, where southern charm and Texas hospitality reside, is a three-bedroom 100-year old Colonial Revival home with lots of charm and history. This property opened November 7, 2012 and is now ready for your overnight reservation. The house provides three upstairs guest rooms each with custom decorations and antique accents. Each room is equipped with HD-TV, Wi-fi, and luxury linens, spa robes, and cool-coil mattresses for the most restful sleep you'll find anywhere. Sandstone Street Bed & Breakfast is also available for small events such as baby/wedding showers, luncheons, tea parties, bunco, social gatherings. You don't want to miss this colorful and fun living history presentation of an English Tea Luncheon and Victorian Fashion Show! Call to make an appointment for a tour or to make a reservation: 325-423-2581. Click here to view our website - active January 2013. I have 500 acres of prime Hill Country land for lease near Kerrville, Texas. There are abundant whitetail deer and also exotics available. I have water and RV receptacles at the campsite. Ranch is low fenced with little hunting pressure from neighbors. I have deer stands in place with tended feeders running. Looking for 3 (three) hunters for the general rifle season, (November 3, 2012 thru January 6, 2013). The primary hunter may harvest 4 (four) whitetail deer with no more than2 (two) whitetail bucks. A hunter may substitute an exotic buck for a whitetail buck. One (1) free black buck doe, unlimited free hogs and predators. A family member (spouse/child) is eligible to harvest 1 (one) deer on the primary hunters’ license. Other features: easy access, campsite nearby and motel(s) nearby. It is our belief that at the Llano Church of Christ, the tenderness and fellowship is just as prevalent. The Llano Church of Christ is a congregation of approximately 140 members, served by two Elders, six Deacons, and the Pulpit Minister. If a label is needed, we consider ourselves a conservative congregation doctrinally. However, we are liberal in our love, acceptance, and giving. This church has a passion for God, and compassion for people. “Reaching the Lost” is a top priority. Being involved in community outreach, World Bible School efforts, and supporting eight different missionary teams is sealed into the backbone of this church. We take very seriously Jesus’ command to “Go into all the world…” (Matthew 28:19) And of course, the church on the “home front” is never neglected. The Llano Church of Christ strives to, “…correctly handle the word of truth.” (2 Timothy 2:15) We are deeply committed to restoring the First Century Church which we read about in the New Testament. We believe that by, “…speaking the truth in love, we will in all things grow into Him…” (Ephesians 4:15) and win souls for Jesus Christ. As the bride of Christ, we will be forever faithful to our groom. Restaurant, Dinning, Dancing, Live Music, Pool Tournaments. Beautiful surrounding with outside patio dinning around the fountain and fireplace. Outside concerts and much much more! Scott & White Home Health's mission is to provide the highest quality and most personalized healthcare to individuals, while promoting independence in the comfort of their own home. Our Hospice provides comfort for those patients who are terminally ill. Our trained caretakers support both patients and loved ones with physical, emotional and spiritual needs. We offer a variety of gifts as well as vitamins and suppelements that include brands such as, "Bluebonnet", "Solaray", & "Barleans" as well as herbal tea. We have gift cards for every occassion, jewelry, name brand flip flops like "Sanuk", purses, home decor, kitchen items, wall decor and more!! We offer tanning, with 5 tanning beds to choose from. Monthly packages are available or you can pay per tan. We are currently accepting name brand clothing consignments in our, "Two Timing Couture" section of the store for men, women and children's clothing and name brand accessories. We now offer a 90 day layaway program and we encourage and welcome bridal and wedding registries. Condor Document Services provides customers in the Texas Hill Country with secure document shredding. Using our services you can be sure your confidential material is destroyed in the most secure and compliant way. Condor Document Services recycles 100% of the paper shredded. Our prayer is that you would be blessed and strengthened by the power of Jesus Christ. We are a gathering of believers coming together to declare the glory of the Lord and celebrate Jesus as King. We study the Word, practice what we learn and in the process grow together. May God richly bless you! We believe the Bible is the inspired Word of God, given to us for instruction and direction in daily living. Our mission is to present Jesus Christ as Savior from scripture and to equip those who respond to serve and follow Him. We are a Bed and Breakfast that is open seven days a week and are located adjacent to the John L Kuykendahl Event Center on West Ranch Rd 152. We have three Texas/Western styled bedrooms and rent by the bedroom or rent the whole house depending upon customer requests. Circle Your Wagons B & B has a star gazing pavillion, a painted cistern with Hill Country scenery to enjoy, and we have a large rock BBQ pit for cooking-up your favorite goodies! We welcome high school and family reunions, birthday parties, and special festivities you may have planned. An event fee may apply. Please call if we are not at the site. See us online at www.circleyourwagons.com and check us out on our facebook page. Llano Journey Fellowship holds our services at 502 Bessemer Ave. in the Historical Railroad District. Sunday Mornings we have fellowship at 10:30 and our Service starts at 11:00. Our mission is to provide a long term commitment to the restoration and development for parks and recreation within Llano County. We strive to maintain a working -relationship with local government and community in our efforts to finance, plan and execute plans to provide safe, fun and engaging outdoor enjoyment for the betterment of all ages. We believe that strong parks and recreation attractions not only are essential for child development but also play a crucial role in maintaining a strong family unit, strengthening the backbone of the community. While building pride and increasing citizen interaction, strong parks and recreation areas are also essential for promoting good health, tourism, reducing crime and boosting the local economy. Our hope and vision is the development of our parks and recreation to a level that exceeds the traditional standards. We envision a day when we will become a destination spot for families and day trippers, providing high quality entertainment for all ages and of all types. Independent product consultant for doTERRA Essential Oils. Llano River Place consists of three historic, comfortable country homes located in Castell, Texas. They are all perfect for your family vacation or a peaceful get-away for two. All properties are a short walk to your own private access to the beautiful Llano River where you can fish, kayak, tube, or just sit in the shade and watch the river flow by. Each house is available separately or in combination to suit your particular needs. All Llano River Place properties are pet friendly! Management resides onsite to make sure your stay is a pleasant one. Castell is a small community located in the heart of the Texas hill country. We are a 90 minute drive from Austin and San Antonio, and are only 35 miles north of Fredericksburg. Our favorite watering hole is the General Store where on Fridays you can find the best hamburgers in the area and on Saturday join the locals for a cold drink and some of the tastiest BBQ you'll ever eat! The Store hosts live music on occasion and is always open to enjoy the big game on the big screen. Castell is also home to two historic churches and an historic school house that serves as a community center. Located between Llano and Mason, Llano River Place's close proximity to the Fredericksburg, Marble Falls and Kerrville areas make day trips a breeze. The Castell area is home to excellent hiking, biking, bird watching, fishing and other outdoor activities. Shopping and antiquing opportunities abound. The Spotted Possum is your one stop fashion fix! We offer a wide variety of ladies' clothing and accessories, as well as home decor items! The Spotted Possum: "Affordable fashion for beautiful women". LOCATED JUST ON THE NORTH SIDE OF THE LLANO RIVER BRIDGE, NEXT TO THE MUSEUM! Rocky Lake Ranch is a secluded 350 acre ranch with private 7.5 acre lake to enjoy fishing for trophy largemouth bass just outside the town of Llano, Texas. There is a luxurious custom-built lodge overlooking the lake with Whitetail, Axis, and Blackbuck throughout. Enjoy the kayaks, 18' bay boat, pet deer in the yard, wildflower fields, or just the views from on top of the Riley Mountains. Hunting guides and/or a cook are available upon request. HOURS OF OPERATION: Mon, Tues, Thurs, Fri & Sat by appointment. Call today & schedule with Vivian! Business location next to Eye Country on Hwy 16 South (Ford Street). Also, check out our Facebook page below! We are in the process of moving next to Charlie's Store at 828 Ford Street! Stay tuned!! KHLB / Lone Star 102.5 FM is a community-centered radio station that seeks to provide steadfast visibility and support as it contributes to the economic and cultural enrichment of the Texas Hill Country by offering dynamic, local news programming and contemporary country-music entertainment. The Westerman House is a Bed & Breakfast is located at 700 East Sandstone, walking distance from the historic courthouse square and the beautiful Llano River. This 1920's era Craftsman bungalow sleeps four with a queen-size bed in the front bedroom and a queen-size Murphy Bed in the family room. The house also features a cozy living room, dining room, and kitchen, as well as a fenced yard and covered off-road parking. We are pet friendly. The rate is $150 per night, which includes the hotel tax. Call 325-248-4107 to schedule your stay. Visit our website: thewestermanhouse.com or on Facebook. KVHL is your non-profit with a voice and we are happy to run free PSA's on the radio for all the area non-profits. We also add them to our Community Calendar with a link to the non-profit's website. Part of our mission is to help raise awareness for our non-profit brothers and sisters in the communities we serve in San Antonio, the Hill Country, the Highland Lakes and the Big Country. We offer both cost free and very cost effective partnership opportunities. Submitting your PSA’s to www.tpr.org <http://www.tpr.org/> is completely free of charge. Simply click on Events, click on Community Calendar and finally click on Submit Events and fill in the blanks. Further, there are also opportunities to consider exchanging space in your program guide for airtime or Media Partnership at one of your upcoming events. For more information or to get your questions answered, please contact me - Mikie Baker - at [email protected] or call to 830-460-0077. KVHL is your non-profit with a voice and we are happy to run free PSA's on the radio for all the area non-profits. We also add them to our Community Calendar with a link to the non-profit's website. Part of our mission is to help raise awareness for our non-profit brothers and sisters in the communities we serve in San Antonio, the Hill Country, the Highland Lakes and the Big Country. We offer both cost free and very cost effective partnership opportunities. Submitting your PSA’s to www.tpr.org <http://www.tpr.org/> is completely free of charge. Simply click on Events, click on Community Calendar and finally click on Submit Events and fill in the blanks. Further, there are also opportunities to consider exchanging space in your program guide for airtime or Media Partnership at one of your upcoming events. For more information or to get your questions answered, please contact me - Mikie Baker - at [email protected] or call to 830-460-0077. Oma's Haus is a 2-bedroom, 1-bathroom house that is located about 8 miles North of Llano on Hwy 16 near Cherokee. We pave driveways to highways; call us for your paving needs! Drive through service located in front of Steve's Liquor store. Get ice and cold beer here! Keep up with news on our Facebook page! Join us for great musical entertainment the first weekend in April each year! The tradition of western string continues! Open fiddle contest begins Saturday at 10 am! The Guest House on College St.
A 2 bedroom 1 bath cottage conveniently located 0.5 mile from the historic Llano square at 207 E College Street. This cottage sleeps 6 with a queen in the first bedroom, a double and twin in the second bedroom and a twin sofa sleeper in the living room. There is room to relax on the front porch or grill on the covered patio. Stocked kitchen with refrigerator, oven, dishwasher and microwave. Located at next to the Iron City Saloon building on Bessemer St. in Llano (north of the Llano Bridge). Shop for kitchen, bath & bed items as well as antiques! A great little place to gather on the Llano town square! A comfortable atmosphere with a fantastic Texas Hill Country wine menu and items from San Saba Olive Oil Company. Caudle's Sporting Goods on the square in downtown Llano! We are located right next to Dixie Lane Boutique. Come to us for men's gifts and sporting gear. Sealcoat Specialists provides parking lot maintenance services to the Hill Country, South Texas, and Central Texas. Our services include slurry seal, line striping, crack filling, pressure washing, asphalt and concrete repair. Along with these services, Sealcoat Specialists also does hot rubberized crack seal for the TxDot Highway Mainteance Department as well as slurry sealing and striping of Municipal, Executive, and International Airports. Sealcoat Specialists is insured, approved by TxDot, and depot compliant. With offices in Beaumont Texas and Lake Charles Louisianna, we are looking to help any type of company or individual that wants or needs an affordable service driven marketing firm. We really dont care how big or small your company may be as long as we are helping you acheive the most success with your advertising and marketing needs. It also doesn't hurt that our owner and wife, (Jarred & Monica DeMore) try to spend as much time as possible in their home away from home city... LLano! We've been in business since 1982 and we have the depth of knowledge required to take your brand awareness to the next level. We do it all in-house too: from electronic media, such as television, long format videos, radio, and interactive, to a wide variety of print design, such as logos, brochures, billboards, and trade show booths, to fully fuctional websites that include product sales, as well as promotional item branding. Browse around our site and see for yourself! We would enjoy a visit on the services you may need. Give us a call and thank you for your time! Glass art and gifts in the Hill Country handcrafted by local artists. Custom fused glass yard art, suncatchers or window inserts and dichroic jewelry classes. See us on Facebook at The Sandwich Stop! Sweet Tooth of Spicewood, TX. Sweet Tooth of Spicewood, TX. offers that personal touch. Sculpting, weddings, open house, baby showers, birthdays & retirement are just a few of the occasions we cater. Sweet Tooth of Spicewood, TX will turn your imagination into reality. Low fence. 120 acres, 6 miles east of Llano. 3 hunters on a season lease. Cardboard, paper, tin & aluminum. No glass allowed. ABSOULUTELY NO HOUSEHOLD TRASH MAY BE DUMPED AT THIS LOCATION. Guided hunt on 320 acres of high fence (7 years). Looking for 2 hunters. Whitetail deer. Water, electricity & travel trailer on site. Ranch work, welding, etc. call for more information about other skill sets not listed. Hill Country Telephone Cooperative (HCTC) is the third largest telephone cooperative in Texas and serves customers in more than 2,900 square miles of rugged Hill Country terrain. As part of the HCTC family, Hill Country Telecommunications (HCTC) recently expanded its fiber optic network services into the markets of Kerrville, Mason, Junction, and Fredericksburg. HCTC offers very high speed Internet delivered via fiber optic cable, residential and commercial telephone service, security alarm services, and technical support services. Texas T Bed and Breakfast is a wonderful secluded getaway with a million dollar view of the Texas Hill Country. It's located less than 1/2 mile outside the city limits of Llano so it's close to town and other area tourist sites.The cabin has a Texas/Western theme inside and out and has alot of amenities. So what are you waiting for....come see us and have a great stay. We help add to the quality of your life by providing weekly curbside household waste collection that is professional, dependable and value-priced. You’ll be served by modern vehicles chosen for their dependability and fuel-efficiency. You’ll find our drivers are highly trained, respectful of your property and concerned with neighborhood safety. In additional to traditional curbside collection, you can also enjoy specialty services including residential waste recycling, green waste collection, bulky item pickup and help with household hazardous waste (HHW) disposal. Tree and bush shaping and pruning according to ISA standards, tree illness verification. Currently participating in Llano Master Gardener certification through Texas Agrilife Extension, TAMU. Season lease for 2 guns or bow in Llano County! Science Mill is a family destination offering a fun, interactive learning environment for all ages. Through cutting edge technology-based exhibits, games, and programs, the Science Mill expands students’ understanding and appreciation of science in their everyday lives. By igniting their curiosity and inspiring them to pursue post-secondary education, the Science Mill experience starts students on the path to a life-long career in science, technology, engineering, and math (STEM). KJC Ranch is a uniquely established, high fenced, exotic game ranch located 16 miles north of Brady, Texas. We offer hunting packages and lodging rentals. KJC Ranch welcomes all types of hunters and non-hunters for wildlife viewing, fishing, meetings, photo safaris, and hill country getaways. We also sell exotic and whitetail breeding stock. Fudge and candy store on the Llano Courthouse Square opening June 1, 2016. Open 12-6 Wed - Sat! Beautiful murals and paintings cover the walls of this romantic 1920's BnB, and transport you to another place and time. We are just down the road from Llano, in charming San Saba, just behind the Wedding Oak and Old Man Scary Wineries. We serve a delicious hot breakfast with a variety of choices. Our rooms have all the luxuries including king size beds, wifi, Direct Tv with premium channels, fridge, microwave, robes, ice maker, etc. We have a huge tree filled yard that you can enjoy from our front porch swing or screened balcony. If you are looking for unusual quality and quiet comfort, check us out online at our website or on Facebook. Please note our policies and that our rooms are upstairs! Pecan Grove Veterinary Services provides ambulatory equine and livestock veterinary services to Llano and the surrounding communities. We are a fully equipped mobile veterinary practice with a special interest in equine dentistry and lameness. Appointments are seen 8-5 M-F and a veterinarian can be reached for emergencies 24/7 by calling (325) 248-3401. Call today for financial planning & budgeting aid! Christmas lights strung along the Llano River glow each night for families to enjoy. Come stroll with us! Llano reflects upon the season and thousands of beautiful, colorful Christmas lights along the river. Come join us each night for a walk through the lighted archway that begins with hot chocolate and ends with Santa! Custom light displays built for you! Large or small... Repairs made and lights replaced. Call Eugene all year. See the many displays at Starry Starrry Nights in Llano at Badu Park to view his work! Preschool for 18 months to 5 years & older. 20 years experience; 4 full time employees. Located in the middle of town, right on the Llano River bridge, next to Badu Park and the beach & pavillion! Income-based access to innovative and compassionate legal services in Blanco, Burnet, Llano, and San Saba counties. OPENING JANUARY 15, 2017 on the Llano Courthouse Square! Nomad Strength is a gym focused around leading a healthy lifestyle. We want to build a community around improving lives through fitness, nutrition, and accountability. Our movements and programs are scale-able to any fitness level. McKenzie Jones & JoneSING Entertainment offers music and entertainment to Central Texas and the surrounding areas. From the hills of Llano, to the Gulf of Mexico and all the way up to Missouri. Available for fundraisers, festivals, and private events, McKenzie provides quality family music. A full PA system is available and can be rented with a sound tech for special occasions. Audio cables of varying lengths may be purchased, made to order by JoneSING Entertainment. We can also install your audio/visual equipment in your home, office, or vehicle. We are an air conditioning & heating company out of Castell, TX; we will service a 100-mile radius. River Arrows is a boutique located in the Stuffology Store in Llano, Tx. We feature the company DotDotSmile ! "How blessed is the man who does not walk in the counsel of the wicked, Nor stand in the path of sinners, Nor sit in the seat of scoffers! But his delight is in the law of the LORD, And in His law he meditates day and night. Almighty Services, LLC is a family ran business that started in 2015 as Almighty Air we now offer electrical services resulting in a change of name. Nick started his company to help home owners make the best repair option that fits thier finances. He was tired of seeing so many companies forcing home owners to replace systems or costly parts just to bring in more money. We have done lots of work for residents of Llano county as well as contractors and business. We love our little town and hope that we can earn your business as well. Set to open first to mid-August, 2017. More information coming! Residential and Commercial pest control services with no contracts, termite treatments with renewable warranties, Wood Destroying Insect Reports for real estate transactions, lawn treatments for fireants. Family owned and operated business. I provide SEO or search engine optimization advice at: https://onlinesuccesswithsmith.com. Since 2001, the dedicated staff at Sports Medicine & Physical Therapy (SM&PT) has helped thousands of clients gain strength and confidence through their journeys to wellness. Owner's Andy McDonald, PT, Jody Brown, PT and Ardra Hughes, PT are passionate about keeping SM&PT locally owned and operated and strive to provide the best possible care in the Texas Hill Country. Our experienced clinical staff consists of physical therapists and physical therapist assistants all of whom have a personal concern for your return to health and function. Whether that means returning to a sport, a job, or a way of life, our therapists will work directly with you to educate you and reach your goals. The objective of SM&PT is to provide quality physical therapy and patient care in an environment that is friendly, enthusiastic, up-to-date and motivational. Every patient will be treated with an individualized rehabilitation program to assist them in achieving a safe and rapid recovery. Pick your own berries in the spring; "Harvest of Fall Fun" in October". Welcome to Visiting Angels Marble Falls! We are a locally-owned and operated senior care agency serving families in Highland Lakes, Bertram, Cottonwood Shores, Horseshoe Bay, Lometa, and in other communities throughout the Marble Falls area. Senior care services from Visiting Angels Marble Falls include respite care for family caregivers, Alzheimer’s care, palliative care, private duty care, and other services that make aging in place possible. Flag Creek Guest House is located a couple of blocks from the historic Llano Square. It is a lovely location for quiet getaways. Flag Creek Guest House is a newly renovated one bedroom, one bath home. The bedroom is furnished with a queen bed and for additional guests, the living area has a queen sleeper sofa. The property is bordered by Flag Creek and the Llano River, giving guests easy access for kayaking, fishing or swimming. Friendly family environment serving quality food. Proudly recognized as the oldest and one of the largest affiliates of the Texas Longhorn Breeders Association of America (TLBAA), the South Texas Longhorn Association is comprised of dedicated breeders, ranchers, and hobbyists throughout Texas who raise and love Texas Longhorn cattle. Quiet and clean place to unplug and unwind. We offer 11 RV spots (water/sewer/30 or 50 amp service), 3 cabins (sleep 4-5), and 1 lake house (sleeps 8-10). Have a boat ramp and ample shoreline. Proud veteran. family owned and operated. The historic Badu building has experienced several transformations over the past century since it’s design by Larramour and Watson in 1891. It has been the First National Bank of Llano, a home, a restaurant, a bed and breakfast, and now, a cultural hub for music, food, drinks, cigars, and the bold Texan spirit. We've lovingly and carefully restored this timeless building because it is a reminder of our past and a symbol of the memories that we will make in the future. Workforce Network is a collective group of skilled consultants who are ready to provide fiscal, talent, and operational management solutions to meet your business needs. With over 30 years of experience in the provision of non-profit, grant-funded programs, and center operations, Workforce Networks’s expertise includes technical assistance, talent management and organizational design. Welcome to Highland Lakes Tiny Homes! My name is Lisa Morgan and I am excited to be an authorized retail outlet for Platinum Cottages. Located just one hour west of Austin in Kingsland, we serve the Texas Hill Country including Marble Falls, Llano, Burnet and Fredericksburg. Highland Lakes Tiny Homes is an authorized retail outlet for Platinum Cottages. We do not have set business hours at this time. Please call or text Lisa at (512) 844-1104 to schedule an appointment. Parcel & Ink provides color printing and copies, lamination, office supplies, notary services, printer ink, gifts and much more. We proudly ship UPS! Victorian style home built in 1890, with themed and authentic decor, large front porch and deck for enjoying nature. A spacious sun porch and warm kitchen for visiting or enjoying a cup of coffee. We are located in heart of downtown Llano. Lake Buchanan Lodge is a rustic lodge in the heart of the Texas hill country on Lake Buchanan. Lake Buchanan Lodge is a newly opened lodge built from 150 year old hand hewn beams moved from Wisconsin. This vacation rental comes equipped with a fully loaded kitchen, 2 bathrooms, 4 bedrooms, and 2 upstairs lofts that sleeps 16 guests total. Relax at this beautiful house on the covered porch, swim in the lake, or fish on the banks. Hike the nature trails, rent kayaks or charter a boat to complete your stay at this beautiful vacation home. REC's goal is to maintain a long-lasting relationship with our clients based on service oriented cost-effective solutions that meet our clients’ needs. Boys & Girls Clubs of America had its beginnings in 1860 with three women in Hartford, Connecticut – Mary Goodwin, Alice Goodwin and Elizabeth Hammersley. Believing that boys who roamed the streets should have a positive alternative, they organized the first Club. With character development as the cornerstone of the experience, the Club focused on capturing boys interests, improving their behavior and increasing their personal expectations and goals. A cause was born. Newspapers / Publications, Publishing Co.